In Northern Uganda, a civil war has raged since 1985 displacing millions from their ancestral homes into refugee camps. But War/Dance is not so much about the horrors of this ongoing strife, but more about the hope that still resides in the children of the Acholi tribe. "In our daily lives, there must be music...if there's music, life becomes so good." The film follows the students of Patongo Primary School as they compete in Uganda's 2005 National Music competition for the very first time. Focusing on Nancy, whose father was murdered by rebels who hacked his body to pieces with a machete; Rose, who lost both her parents in a brutal massacre; and Dominic, who was abducted along with his older brother by the rebels and forced to participate in their killings; War/Dance achieves an empathetic intimacy with its subjects. "In my heart, I am more than a child of war." Writer/directors Sean Fine and Andrea Nix do an outstanding job of capturing the pathos and the passion of the Acholi people, but it is Fine's gorgeous cinematography that deserves most of the praise. With shots framed like portraits, he conveys the colors and the rhythms, the ugliness of the living conditions vs. the beauty of the country, the horrors and the hopefulness. Visually, it's a beautiful piece of work. Aurally, War/Dance resonates with the drumbeats and chants of the Acholi tribe--and in the echo of those sounds, there is the triumph of life. "Music...is our tradition. Even war cannot take it from us." "I'm excited to see what peace looks like." Now there's a sight that's worth seeing! 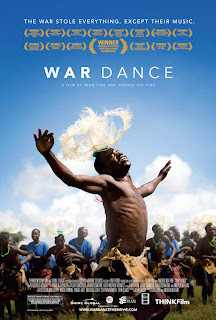 For more info about War/Dance or to purchase the DVD, check out the Shine Global website.